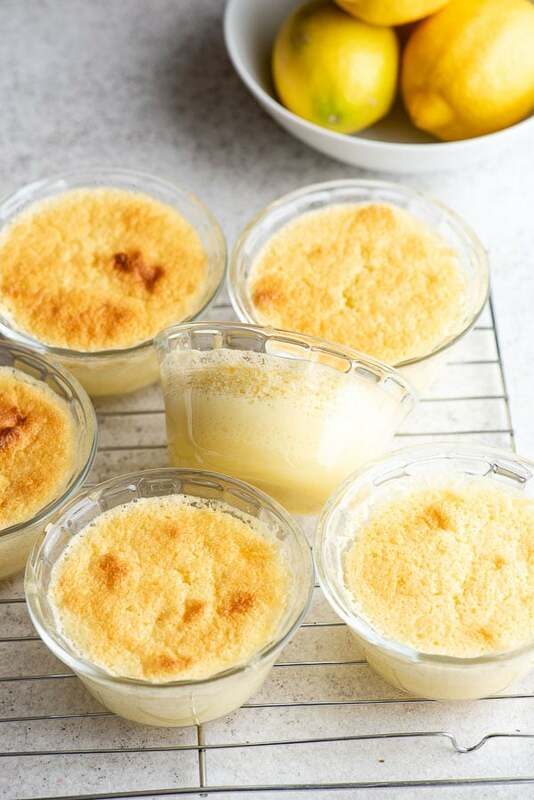 Lemon Baked Custard with Sponge Cake Top is an easy, magical dessert. Baked in individual custard cups, the batter forms two layers; a creamy lemon custard on bottom and light, airy cake on top! Gluten-free and gluten options. This recipe was originally published in March 2011 and has been updated in April 2018! 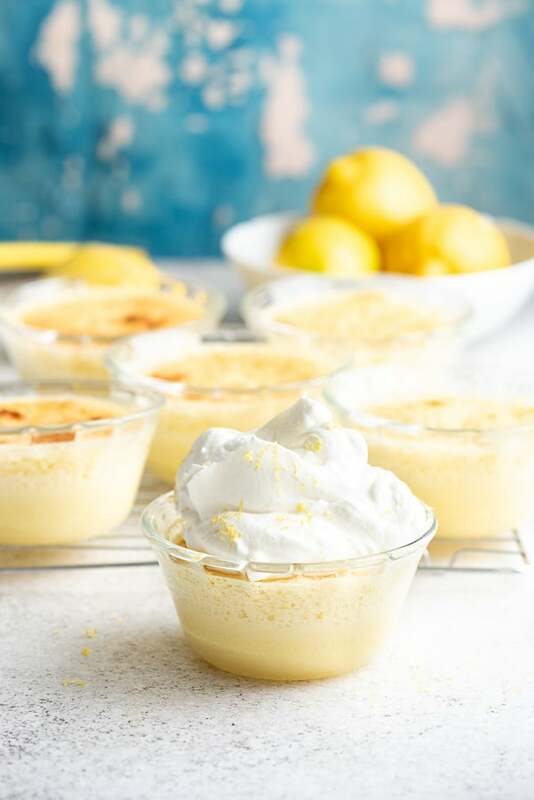 Today’s recipe is a reprisal of my ALL TIME favorite childhood dessert: Lemon Custard with Pillow Top (or at least that was the name on my Mom’s recipe card). This simple lemony delight is a recipe my grandmother and mother each have made for as long as I can remember. 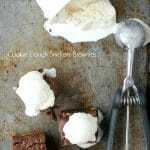 I shared the recipe early on Boulder Locavore but the time is right to dust it off to share again! As a child I thought this recipe was magical. 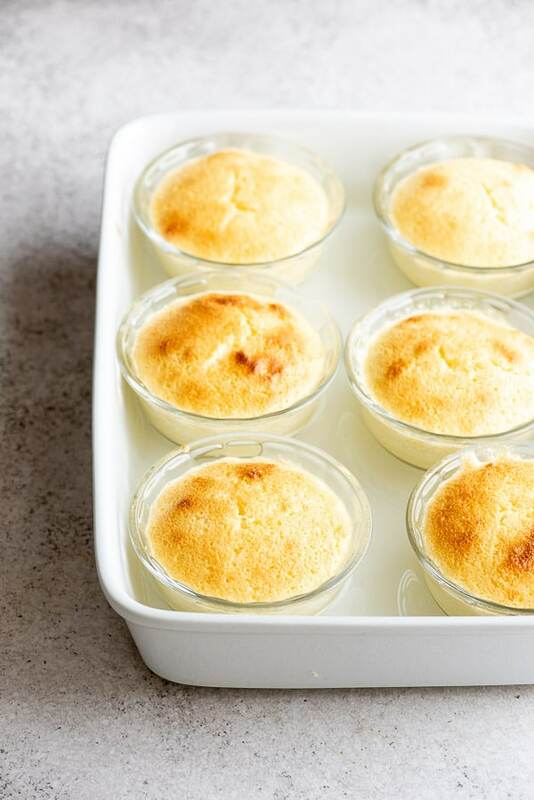 Baked custard in individual cups, this lemony dessert is part custard and part cake. As it bakes the batter separates and forms a rich lemon custard on bottom and light, cakey top layer. When I first shared this recipe in 2011, my mother told me she thought the origin of it may have been from The Joy of Cooking. Makes sense. My grandmother did not develop her own recipes, that I’m aware of, and at the time one jotted down their favorite recipe on a recipe card and stuck it in their recipe box for easy access. Before starting my redo here, I became curious about this recipe’s lineage and looked it up in The Joy of Cooking. It wasn’t there. I mentioned it to my husband who is an excellent cook and curator of the hundreds of cookbooks we own. He said that I was looking in a more recent version of The Joy of Cooking (copyright 1997); that the early version, that schooled in everything including how to skin squirrels, was a different version. He pulled out an earlier version, a 1975 printing of the original copyright 1931 cookbook. Indeed, I found ‘Orange or Lemon Sponge Custard’ which very closely resembles my family recipe. There were modifications, even between my grandmother’s recipe card and my mother’s. And I’ve tweaked it a smidge myself! Having not made the recipe for some time, I did a test run wanting to be sure there was no tweaking needed (there was). The recipe is an easy one and fascinating, illustrating the magical qualities of baking (chemistry really). A batter is made of softened butter, sugar, salt, egg yolks, lemon juice, lemon zest, flour and milk. Egg whites are beaten until firm but not dry then folded into the lemony batter making a bumpy, foamy mixture that never hints at the delicious end result forthcoming. The mixture is spooned into custard cups, baked in a water bath and served hot or chilled. A dollop of freshly whipped cream on top makes it even better. 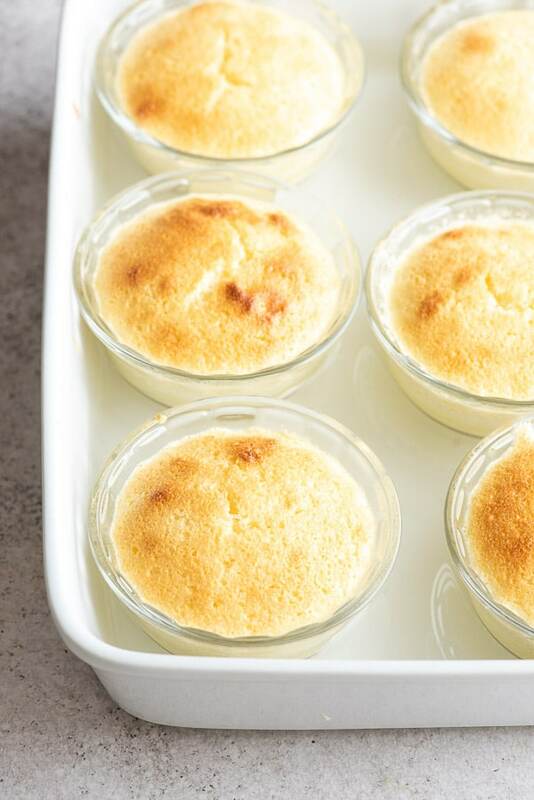 NOTE: the baked custard will relax as it cools with the puffed top becoming flatter as shown in the photos. SHORTCUT PREP TIP: I keep a bottle of fresh lemon juice (real lemon juics not from concentrate) in my refridgerator all the time. This saves the time of juicing the lemons and provides the same quality juice! A water bath is a manner of cooking by adding containers of ingredients to a larger pan of hot water to be baked in the oven. The benefits of a water bath is that it adds moisture while cooking to prevent cheesecakes from cracking or custards from becoming rubbery. It also provides even cooking temperatures all through the cooking time. The water added into the pan is hot so there is no temperature shock to the items being cooked in the water bath. A few years back there was a craze over something called ‘Magic Cake’. Do you remember that? It did not escape my culinary curiosity either. I made a Blood Orange Magic Cake with Candied Almond Slices version and one for the holidays Eggnog Magic Cake. While making this the Lemon Bakes Custard it struck me these were the predecessor of Magic Cake; a batter that separates during cooking to make two distinct textures in the finished dessert. 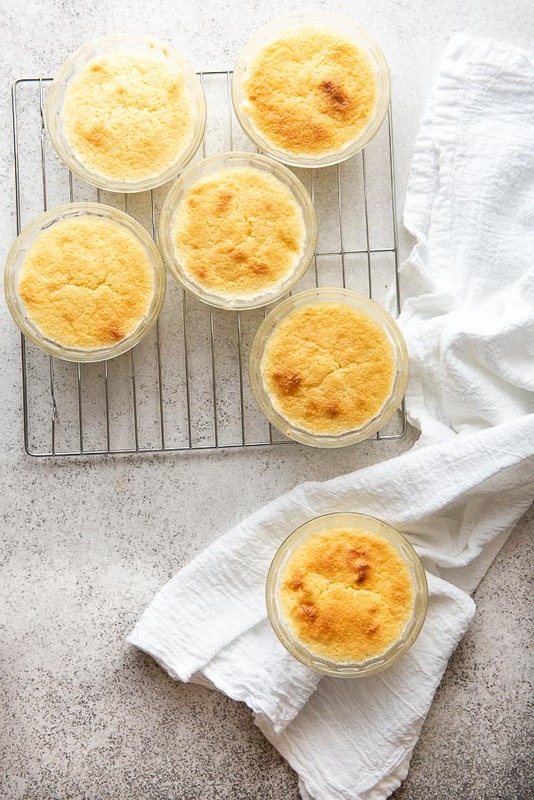 I still have the original Pyrex custard cups my grandmother used to make this recipe. I’ve misplaced a few so just reordered the current version of the custard cups online. They are perfect because you can see the layers and they have a vintage vibe I love. They are affordable and handy for prepping ingredients, holding small items and many more uses. 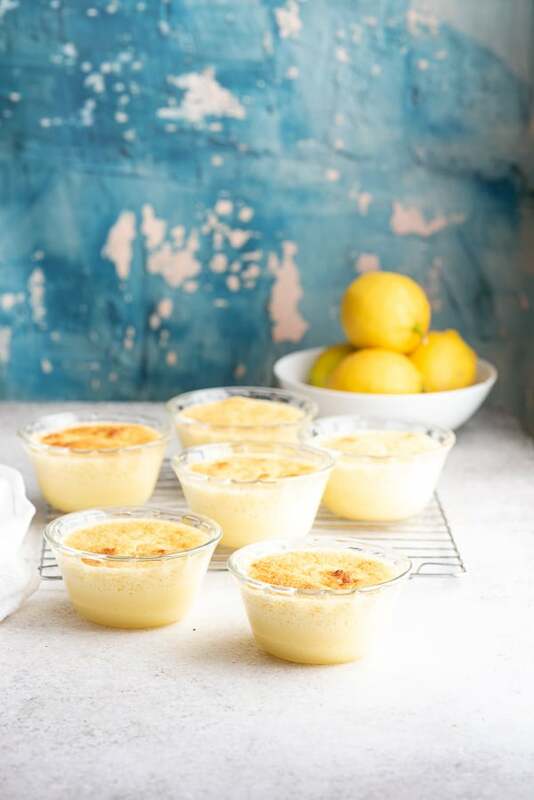 If you’ve tried this Lemon Baked Custard recipe or any other recipe on BoulderLocavore.com please don’t forget to rate the recipe and let me know where you found it in the comments below, I love hearing from you! 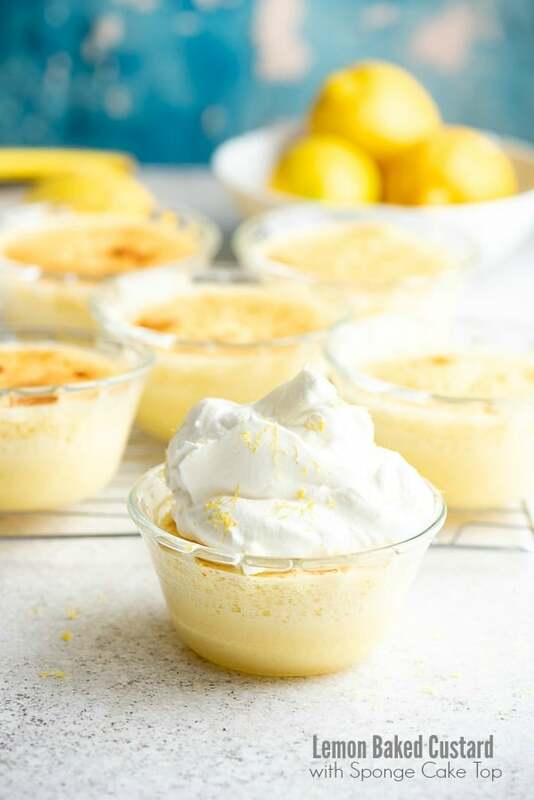 These simple to make lemon custard cups with a light, cakey top are refreshing and unique. The custard batter naturally separates during cooking to form a layer of actual lemon custard and a cake. Fresh and light, they are always a welcome treat at the end of a meal! Preheat oven to 325 degrees. Butter 6 6-ounce custard cups or ramekins. In the bowl of a standing mixer, cream together the softened butter, sugar, salt and lemon zest. Beat in egg yolks. Slowly pour in lemon juice and milk, alternating with the flour; mix to combine. In a separate upright mixer bowl or using a hand held mixer, beat the 4 egg whites until firm but not dry. Fold the egg whites gently into the lemony batter just until combined. NOTE: it will be slightly lumpy. 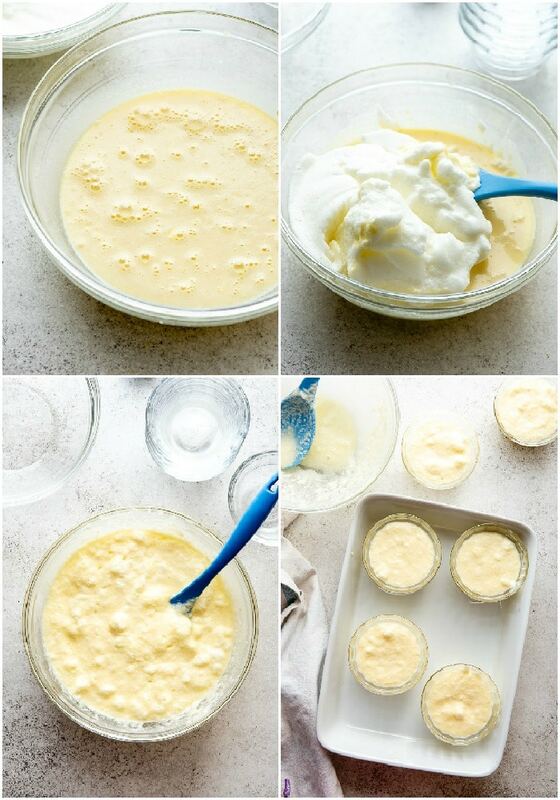 Evenly spoon gently into the prepared custard cups (do not pour). Place custard cups into a 9-inch by 13-inch (or larger) baking pan. NOTE: they should not be touching each other. Add hot tap water to reach halfway up the side of the custard cups (water bath). TIP: place the baking dish on oven shelf before pouring the hot water in. Cook until the custards are lightly browned on top and a knife comes out clean; approximately 30-40 minutes. Remove from oven and allow custards to remain in the water bath an additional 5 minutes to set. Transfer to a cooling rack. May be served hot or chilled. Both my grandmother and mother made this and each had a different name for it (that really did not describe it very well lol)! Hope you’ll love it Mikki! It’s a magical dessert I think. Oh my word these were delicious!!! Thank you so much for this fantastic recipe. The fluffy top was just great. I will definitely keep this in my lineup. Mercy! Love me a good lemon dessert! OH these look DELICIOUS!! I love lemon anything! This is the first time I came across this recipe. I haven’t really tried making desserts this way. The sponge cake topping is a great idea. 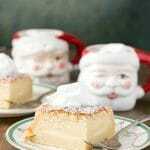 I will try my best to recreate this yummy treat this weekend. Thanks for the detailed and easy to follow recipe. Well I can’t take credit for the cake topping, it’s part of the recipe that just happens when the batter is baked! It’s ideal really, one batter and two desserts in one after baking, right? What a beautiful lemon dessert. I love the distinct layers of textures! Such a great flavor! 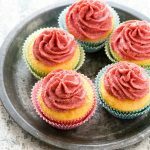 Love these magic cupcakes! They are actually custard cups with a cake top, not cupcakes. You be surprised to take a bite thinking they were cupcakes! Such an amazing dessert!! My family would LOVE this! My mom makes a dessert like this and I absolutely love it! I always have a lot of lemons around from our Meyer lemon tree so I’m making this for dessert over the weekend! This dessert looks super delicious! Anything lemon is my absolute favorite! So sweet that you’ve been able to pass along this recipe. Recipes are the best momentos of loved ones. This sounds like a perfect recipe for spring get togethers. Loving your lemon juice tip so you’ve got it on hand. I have those cups too, and I love them! Those layers are like magic! I also love all things lemon! Wandering if I can bake these in mason jars? I think I just might try. Do let me know if you do. They have a bit of a soufflé quality in that they rise above the top of the custard cup and then relax as they cool. I’m not sure a Mason jar would allow that due to the shape. What a delicious looking dessert. This is so perfect for spring with the lemon flavour. I am a fan of any lemon dessert. I think it’s great that this is a recipe that has been passed down, even with some tweaking. Thank you Tara! I guess we each made it our own. Oh yum! You had me at lemon. This looks so delicious and refreshing. 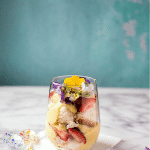 Perfect dessert for spring and summer. These look really good. I hope to give these a try real soon. I love the taste of lemon flavored items, so I know I’m going to love this. You just nailed the spring season in a single dessert! This looks amazing and I’m definitely making these! Custard is one of my favorite desserts. I have never tried lemon custard but I know it would be appealing for the spring. I have got to try these! Great dessert option! 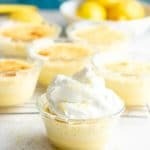 Oh my goodness how delicious does this sound, I am loving the fact it is gluten free and I am all about lemon puddings! I add lemon in almost all my recipes and I just saw this. Very Good! Sensational!